If you are conducting Net Promoter Score (NPS) customer surveys, you will want to know what your NPS score is on the basis of your customers would recommend you or not. If we look at the number of customers who fall into the categories of Promoter, Passive and Detractors, we can easily calculate your NPS. Calculate your Net Promoter Score now! Easily calculate your NPS by entering the percentage or number of people in each NPS category below. Net Promoter Score (NPS) is a metric that measures the likelihood of your existing customers to recommend you. The best way to acquire new customers is through peer recommendations. You can use NPS to gauge the health of your customer base and, in some industries, also compare your customers’ brand loyalty against those of your competitors. What is the best structure of an NPS survey? NPS surveys usually have very similar structure. But there are some differences, and some NPS surveys are more effective than others. 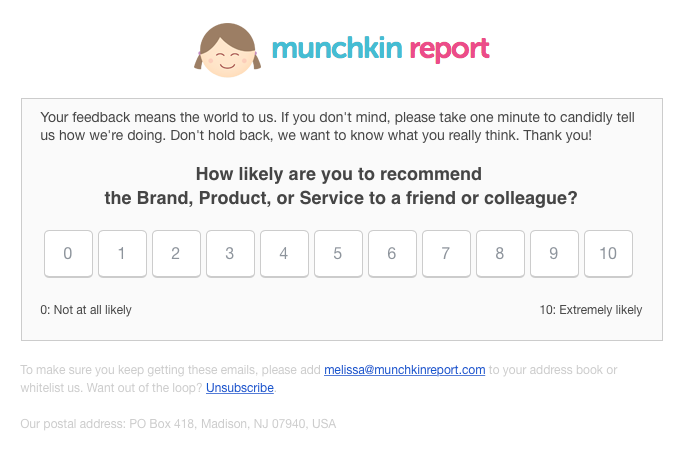 All NPS surveys feature the likert scale question “How likely are you to recommend our company to a friend or colleague?”. This question has a rating scale of 0 to 10 for respondents to answer. With 10 being extremely likely to recommend and 0 being not at all likely. Below is an example of Munchkin Report’s NPS survey. 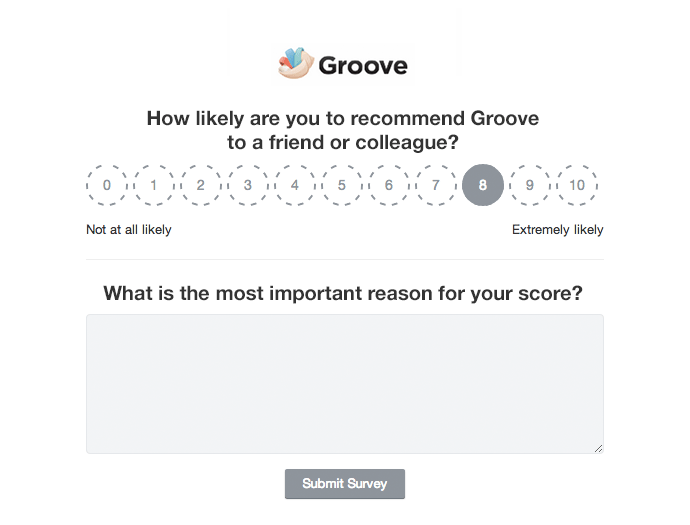 Most NPS surveys add a second open-ended question “Why did you choose that score”, or something similar, to allow their customers share the reason for recommending or not recommending. See below an example from Groove HQ. Promoters are respondents who give a 9 or 10 score. They love the products or services that the company offers. They are typical repeat buyers who recommend the company’s products or services to others. Passives are respondents who give a 7 or 8 score. They are somewhat satisfied with the products or services of the company. However, they could easily switch to a competitor that has a better offer. They probably won’t spread anything negative about the company and its offerings but they are also not enthusiastic enough to promote the company’s products or services. Detractors are respondents who give a 0 to 6 score. They are not happy with the company and its products or services. They most likely won’t purchase again from the company. It is also highly probable they would tell others about their negative experience. Consequently, this could potentially damage the reputation of the company. So, what’s a good NPS score? This completely depends on your industry. Below is a summary of NPS scores by industry, which we found in the Temkin Report: Net Promoter Score Benchmark Study, 2018, based on 10,000 US consumers. Interestingly, the average scores for 2018 overall seemed to have gone down slightly from the 2017 report. These examples are from the New Bain Certified Benchmarks, 2018. The Net Promoter Score can range from -100 (if all customers are detractors) to 100 (if all customers are promoters). When you get a high Net Promoter Score, your company has earned more promoters than detractors. How do I improve my company’s NPS score? Does your NPS score leave room for improvement? Don’t worry, it can be improved (after all, that’s the whole point of using NPS anyway; to know where you are currently, identify areas of improvement and be able to action as soon as possible. You need to perform an effective Net Promoter Score Analysis. It all starts with analyzing your customer feedback properly. You need a reliable solution to be able to identify your key drivers of NPS: What exactly impacts your score? You need to know how to - correctly - analyze your feedback with the right methods to reduce where it hurts (reduce churn, improve retention, customer lifetime value, customer experience etc). Instead of allocating time and resource (human bandwidth) to analyze your feedback in a time-consuming and not very reliable way (with major risk of error), you can get instant, reliable insights with a text analytics solution. This way, you ensure that the insights you’re getting are actionable, and meaningful for your business. You’ll get data-driven insights that you can use to base your business strategy, product development and innovation strategy on. Are you still wondering whether to invest in the Net Promoter Score (NPS) to improve your customer experience? Check out our summary as to why NPS is worth the investment.